This element is supposed to mimic some of the character of Mille feuille. 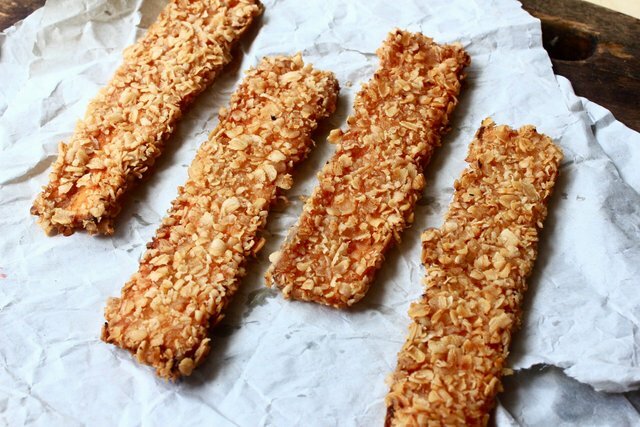 But instead of being crispy and flaky from the outside to the inside, it's only crispy and crunchy on the surface while having a tender sweet full flavoured carrot slice inside. This would act as the layer for the other element to be piped and placed on. 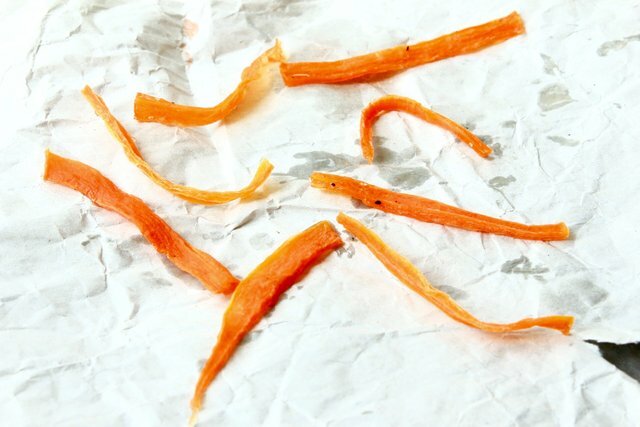 To make this element, firstly you have to slice a whole carrot into thin slices. I used a sharp chef knife to get the job done but you can use a vegetable peeler if you are not skill enough to slice the carrot thinly. Next is to set up the batter station consist of egg, oats and flour. The sliced carrot should go into the flour then the egg and only then the oats. I let it sit in the refrigerator to dry it up alittle so that the oats sticks to the carrot better. Preheat the oil and deep fry the carrot slice until golden brown, drain and it's ready to be used. The point of this element is to add a tangy taste to the sweet dish, it gives a refreshing feel to the palate. The sourness will balanced out the already sweet elements. To make the jelly tomato, you have to first clarify the tomato juice. I used the agar clarification method which involve boiling the tomato juice withthe agar added in the beginning, once dissolve add the remaining cold tomato juice but make sure that the overall tomato juice does not reach below 35c or it will gel prematurely which is not what we want. Then let it cool in a water bath while stirring, strain it with a cheese cloth and you will end up with a clear red tomato juice. Since tomato juice is naturally acidic, we cannot use gelatine to set the solution, thus I have used agar agar to set it. Bring the solution to a boil and add sugar and agar agar. Let it simmer until the agar and sugar is well dissolved. Pour into a square container and chill until set. Sweet brittle and flavourful while giving off its vibrant orange colour. 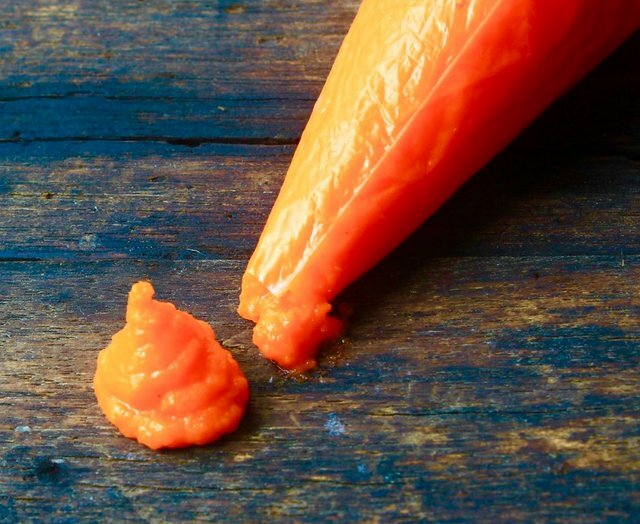 To make this element I cut the carrot into a fine julienne with a more flat surface. Dissolve sugar in water over medium heat and reduce until thick and sticky then mix the carrot strips into the syrup and coat evenly. Let the sugar harden in the refrigerator and it's ready to be use. This would act as one of the crispy element in the dish. Since sweet taste can be enhanced by saltiness I decided to salt my chips. To make he chips, divide the sweet potato into equal halve and then slice it thinly. Deep fried in preheated oil until crispy, season with drain over paper towel and then season with seasalt. Crispy and thousands of flaky layer in this simple looking ball. This puff yam balls are actually a classic savoury dish in Cantonese cuisine and it's often served in dim sum places. But instead of the savoury type I wanted to make use of the texture so I created a sweet version of it. 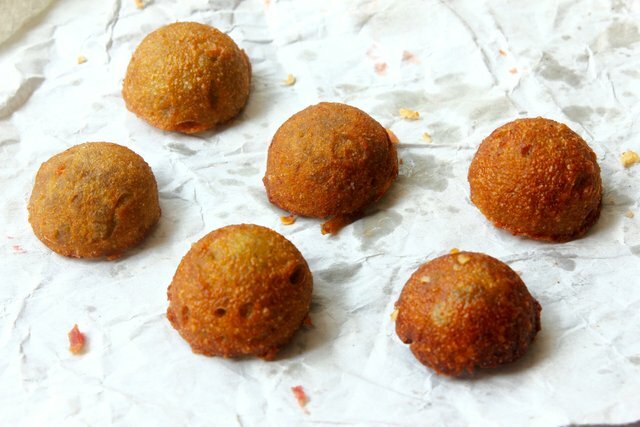 To make the batter for the puff yam balls, firstly you have to steam to yam to soften it which helps with the mashing process. Add this mashed steamed yam to egg, flour, sugar and some butter for flavour. Mix the ingredients well until it forms a thick paste. Scope it into a half sphere mold and freeze. Once it's fully frozen, deep fry the paste in preheated oil until golden brown. Drain and it's ready to be used. Cinnamon a must have when it comes to carrot and pumpkin flavour pairing. Don't believe me? A good example is the carrot cake! Beside that, I have added raisin and honey into the crumble as well as it works extremely well with cinnamon too. 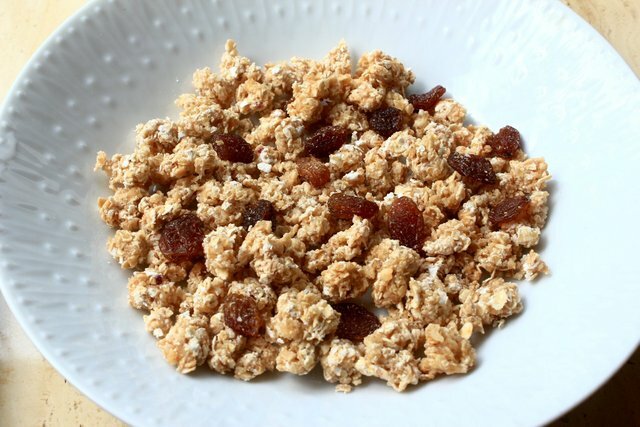 This crumble is crunchy and chewy when you bite the raisin. As for the flavour you will exprience this nutty cinnamony, floral taste. To make the crumble, in a medium heat non stick pan, I toasted the oats until fragrant then I add the honey, raisin and cinnamon. It should start to clum into thick chunks. Refrigerate it to let the sugar solidify then break it into smally chunks with a rollin pin and it's ready to be use. Carrot milk a classic combination, yes I know I used white chocolate but when u think of the White chocolate is essentially milk. Why ? 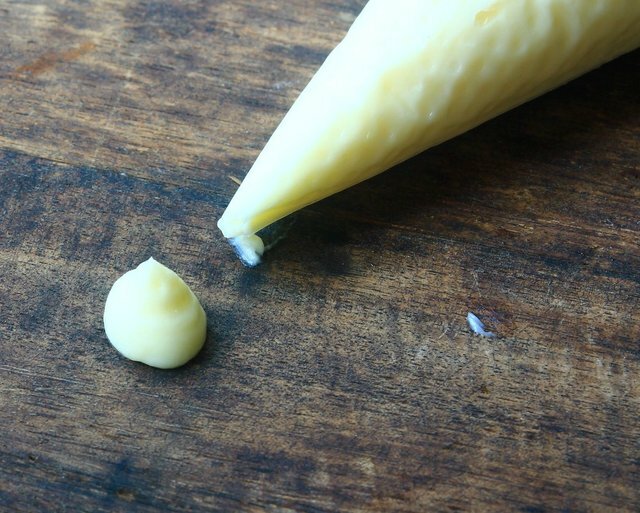 Because white chocolate is made from cocoa butter, sugar and, milk powder. I choose white chocolate instead of milk because white chocolate has a more intense milk flavour and also a smoother mouth fee, thanks to the cocoa butter and milk powder. For this ice cream I have omitted the egg yolk because I did not want any trace of egginess, I wanted the milky flavour to shine through. 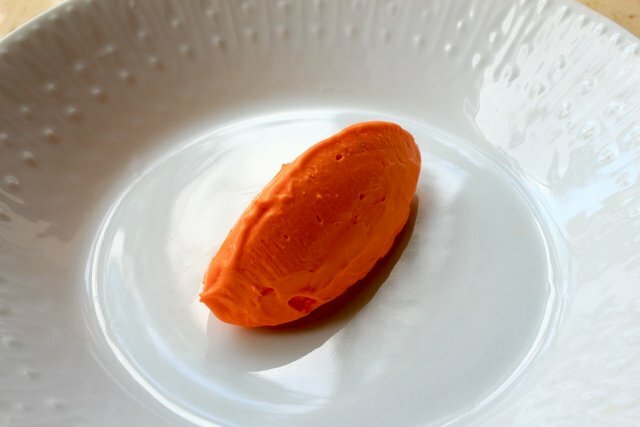 To intensify the carrot flavour without adding too much carrot juice into the ice cream mix which also will make the ice cream icey, I decided use freeze dried carrot powder. Firstly I melted the White chocolate with cream over low heat, once it's fully melted I remove the mixture from the heat and added the freeze dried carrot powder. Pour into the ice cream maker and let it do its thing. After that, freeze the ice cream to your preferred hardness. 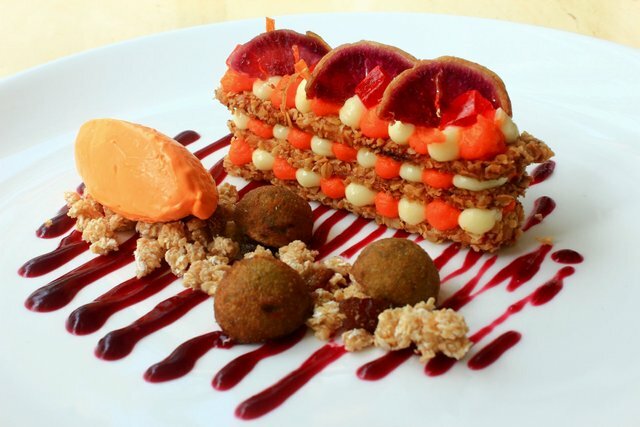 As we all know a good carrot cake is mostly relies on the frosting. This frosting is not only smooth, creamy and sweet but it's also extremely milky. I could have made other kind of frosting but I believe cream cheese frosting is superior over other when it comes to carrot cake. To make the frosting I first whipped the soften butter and soften cream cheese in separated bowl u til light and fluffy. Combine both the butter and the cream cheese and continue whipping while adding powdered sugar. Once the sugar in well dissolve then it's done! Simple and straightforward yet extremely important to the overall dish. It's packed full with the sweet pumpkin flavour while adding smoothness to compliment the other crispy and crunchy elements. 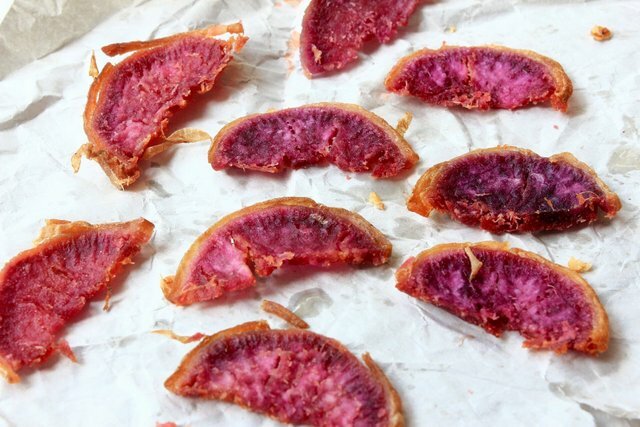 Beetroot colour is just amazing, a dessert with this colour will just elavate the dish visually. 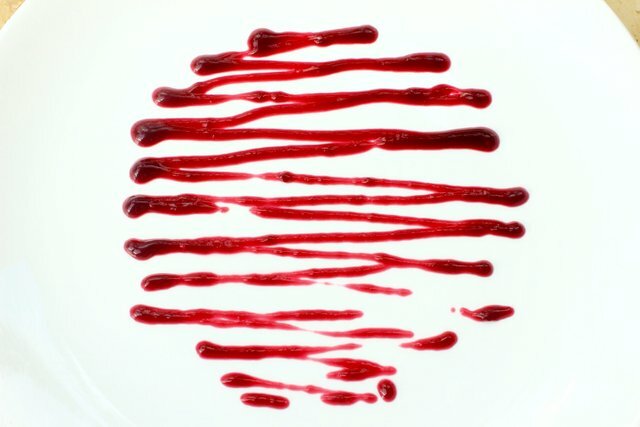 To make the sauce, I heated the beetroot juice over low heat while dissolving sugar to enhances the beetroot taste and pectin to thickening the juice to make it into a sauce. its best served cold, and before using I blended it in a food processors do stieve it to remove any lump. To make the pumpkin purée, I baked the pumpkin in a 130c oven for 3 hours. This method will ensure the sugar in the pumpkin breaks down into simpler form of sugar which is extremely sweet, besides that it also intensify the pumpkin flavour as the dry heat of the oven will evaporate liquid in the pumpkin. Once it's soft, tender and sweet while it's still warm mash it and stieve it through a chinois to get a smooth purée. 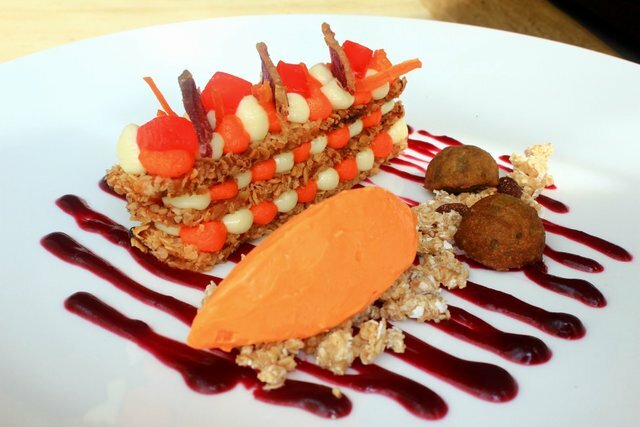 Constructing the " Carrot Mille feuille"
With each layer of oats coated carrot slice, pipe the cream cheese frosting and pumpkin purée in alternating. U can make it as many layers as you want but I found that 3 layers is the most practical when I comes to eating it. On the last layer decorate it with candied carrot strips, cubed jelly tomato and sweet potato chips ( I'm sorry that I missed out the sweet potato chips in the picture above, but anyway you will get to see is below). Thanks to progressive chef for taking his valuable time to host this competition and thank all of you for visiting my post, cheers!!! And have also received a 0.64 percent upvote. Wow, just wow @alansthoughs! 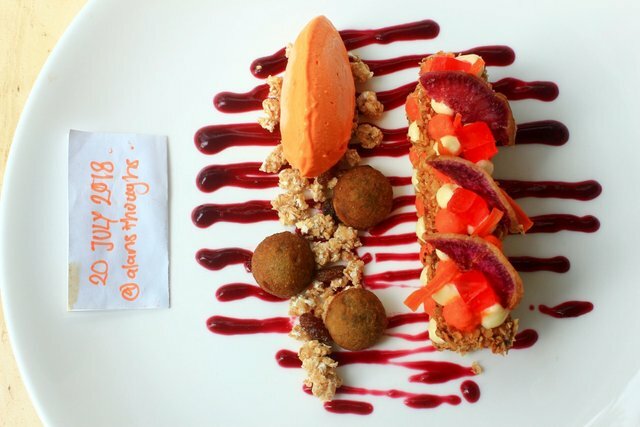 Everything is absolutely brilliant, I would love to be served a dessert plate like this! Thanks @lizelle, likewise to you dish too! My friend you are an absolute genius. This is stunning in every way. A piece of art with so much thought put into it. Wow all the way!!!! Thanks queen of colour and plating! Haha I have a long way to go to match the master that you are. You have your own unique style, and it's comforting to look at! That's nice of you to say. Thank you! OMG! That is one heck of a presentation work on it! 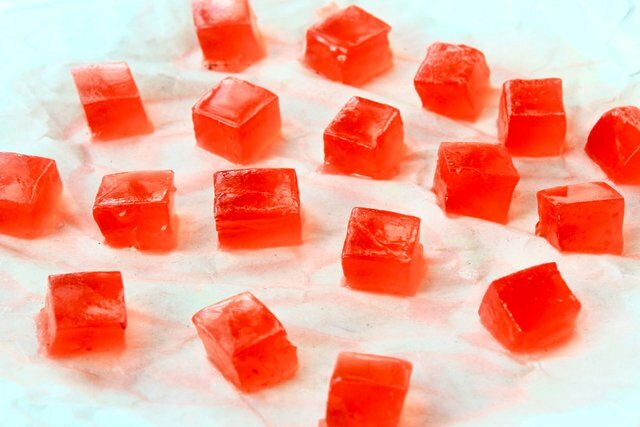 I might actually not have so many combinations (in fear of running out of time to do those haha), but I am really intrigued on how to make the tomato jelly! That's quite a lot of work to do that! Do you have a video on how you make those? My next totally want to try out is the carrot white chocolate ice cream! That would definitely be a tickle of a surprise to many people's taste buds! 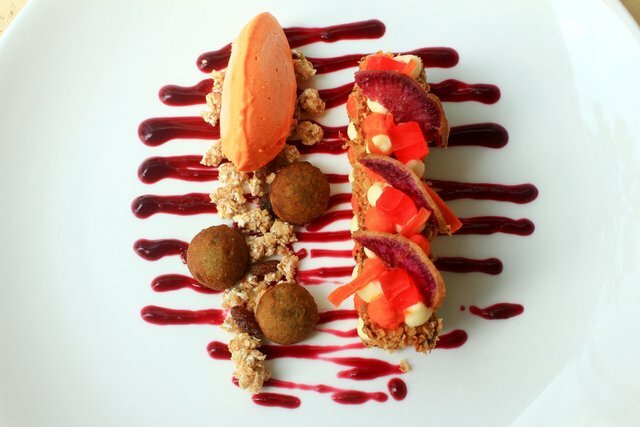 Most of the time a dessert like this would have come out like a sorbet; but you are adding white chocolate? Now that is one interesting kick in my taste buds I would seriously curious to try on. First of all I'm really grateful for your elaborate comment! Yes it definitely took a long time to create this dish, but non the less it was worth it. It's really enjoyable making dishes like that to share with the world especially if you mad amount food! I love while chocolate mainly because it works in many flavour pairing. Sorbet is a good choice but I love making and eating Ice cream more and that's the reason for the addition of ice cream! @alansthoughs you were flagged by a worthless gang of trolls, so, I gave you an upvote to counteract it! Enjoy!! 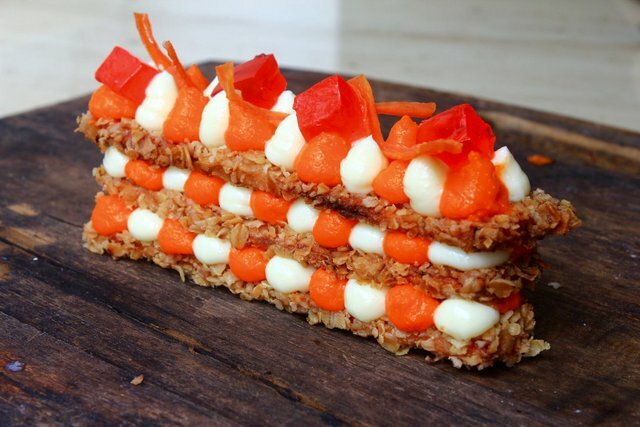 I think it is brilliant how you mimicked a mille-feuille by using carrot slices with coated in oats. All the flavors work together. I just wish I could taste this fantastic creation in person. Nice one usual @alansthoughs. Thanks, vegetables are already amazing! Just need to put alittle effort to make it shine!